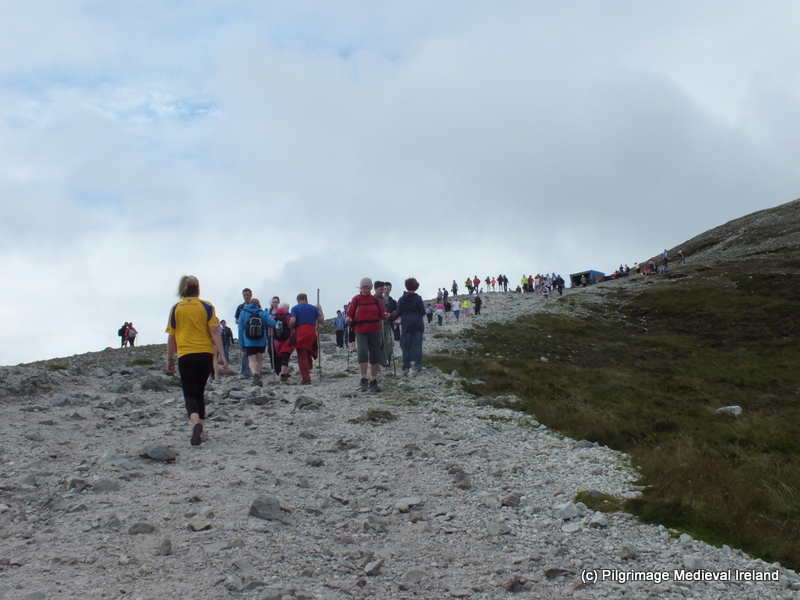 This year I joined with thousands of pilgrims in the annual pilgrimage to Croagh Patrick. 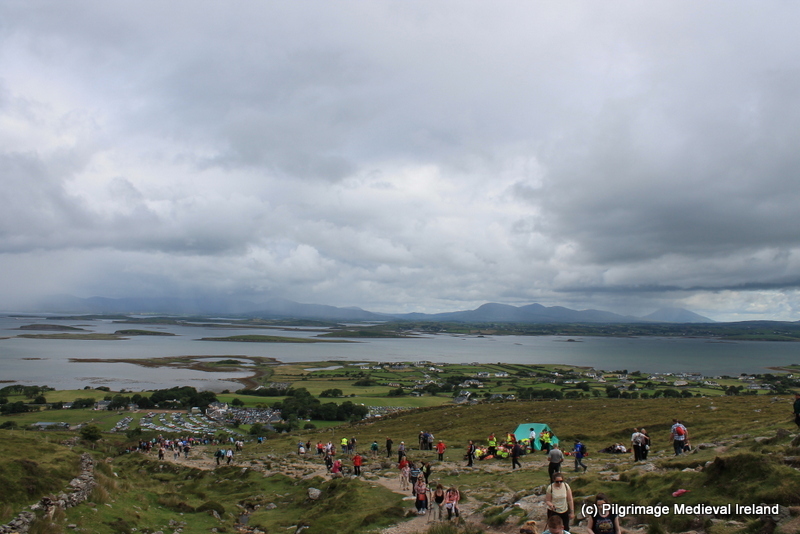 For those of you who might not know, Croagh Patrick is a holy mountain located on the western coast of May on of the southern shores of Clew Bay associated with St Patrick. The mountain is 764m (2510 ft) in height. Pilgrimage can place throughout the year but the main focus for pilgrims takes place the last weekend of August. 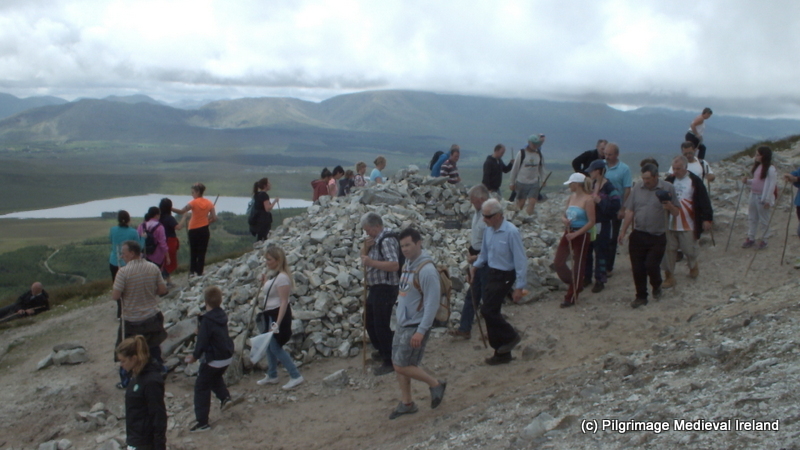 The Friday of this weekend is generally the day local people climb the mountain and the Sunday often called Reek Sunday is the main day for pilgrims from a wider geographical hinterland. Each year on this weekend thousands of people make pilgrimage and ascend the mountain to pray at its summit. There is a long history of pilgrimage at this site which I have discussed in a previous post. 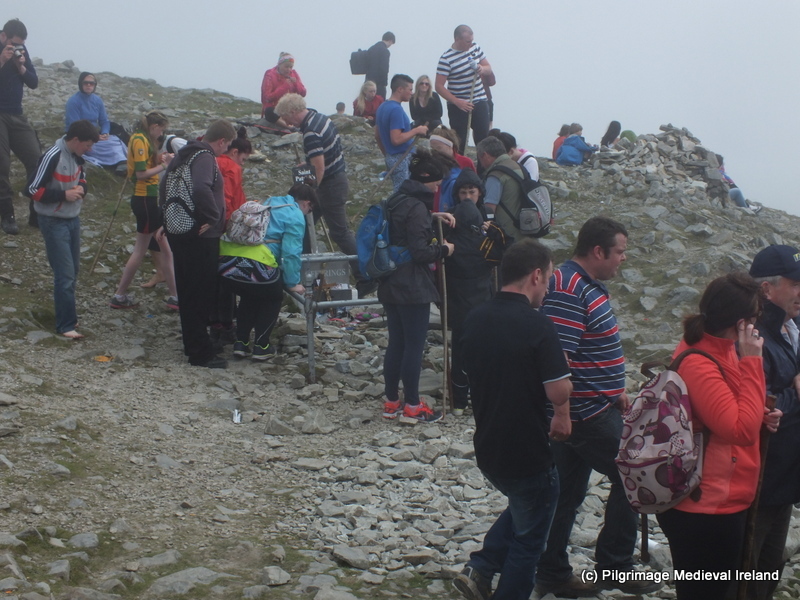 On the morning of the 27th of July I joined with circa twenty thousands pilgrims in the annual pilgrimage to the summit of Croagh Patrick. There are a number of approach route the summit. 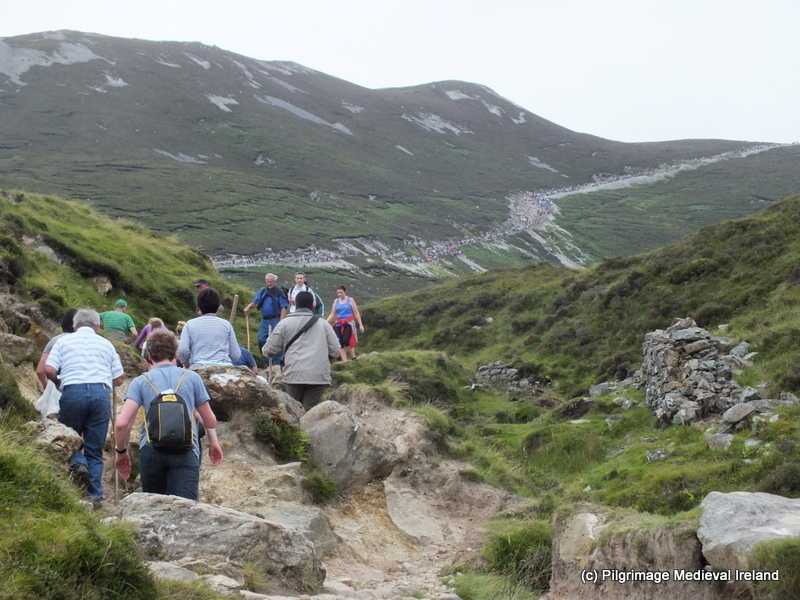 The majority of pilgrim climb from the townland of Murrisk following a track worn by centuries of feet known as the Cásan Phádraig (the Path of Patrick). I arrived by car to the base of the mountain about 10.00am. An early start for a Sunday but not at Croagh Patrick, where pilgrims had begun climbing in the early hours of the morning to arrive at 6 am on the summit. I parked my car in one of the fields converted into temporary car parks to cope with the influx of traffic and paid a 5 Euro fee for the day. As I pulled on my walking boots and pack my rucksack with food and water, I noticed many of the people in my car park were having picnics out of their cars , tea and sandwiches, a reward for a pilgrimage completed or perhaps fuel for the climb ahead. 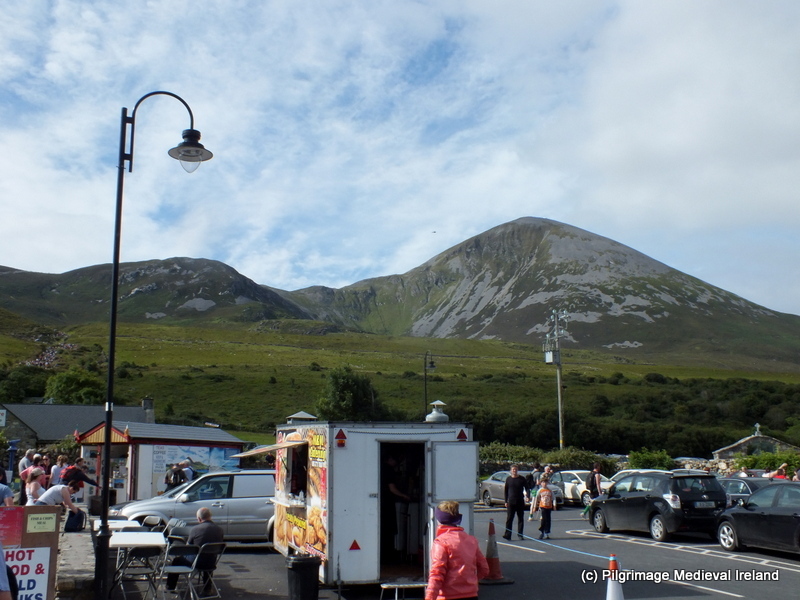 To begin my climb I a short distance to a small laneway located beside the car park of the Croagh Patrick visitor centre. Pilgrims begin their climb at the car park at the base of the mountain. I have climbed this mountain many times over the years in various weather condition while doing research for my PhD thesis but this was my first climb with actual pilgrims. I was slightly apprehensive. I am not a fan of very large crowds and knowing how difficult the terrain of the mountain is I worried crowds the would make the climb uncomfortable however once I began my fears were soon allayed but I was conscious throughout the climb of what was going on about me. 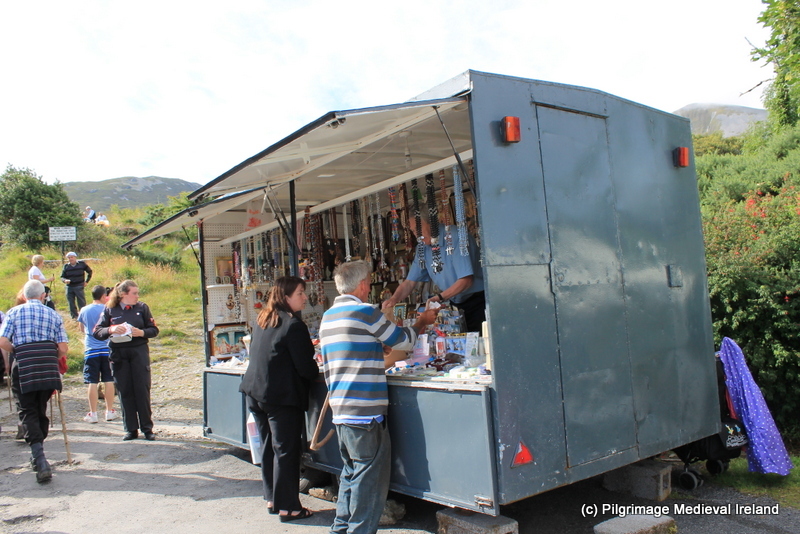 On the main pilgrimage day Mountain Rescue groups and the Order of Malta have a very visible presence and they do really excellent work to help pilgrims get up and down the mountain safely. Croagh Patrick can be a dangerous mountain. Much of the route and in particular the conical top of the mountain is covered by loose shale which moves under foot and can be very slippery in wet weather. The terrain is difficult especially in the final stages. The weather conditions on the summit can be very changeable and temperatures at the top of the mountain can be up to 10 degrees colder than at sea level. 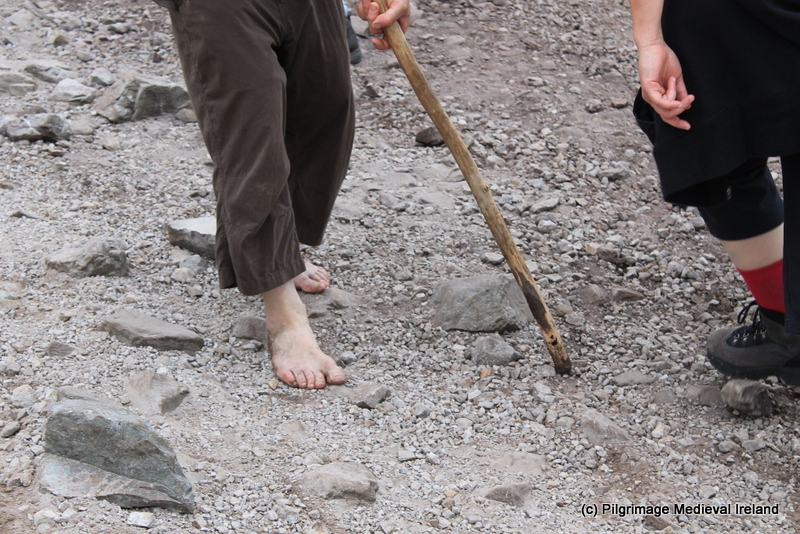 It is very important to be prepared for the climb and to have good footware, appropriate clothing water and a stick. As I walked to the summit I noticed blood on some of the stones on the path and I witnessed at least 3 people fall and many more stumble but retain their balance because of their sticks. 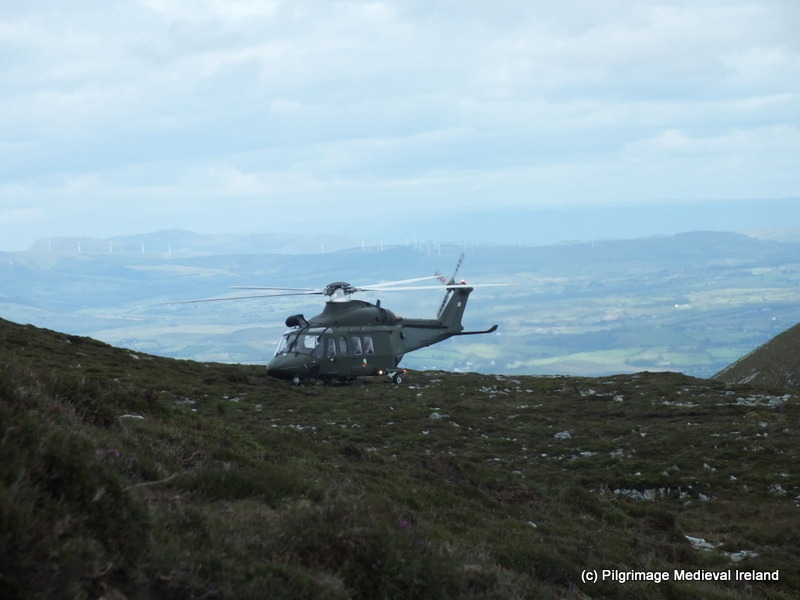 The following day I read that there had been 17 casualties on this years pilgrimage with four people taken off the mountain via stretcher, and two helicopter evacuations. On my way up I saw one person being carried by stretcher from the cone of the mountain and one person being air lifted from the mountain during my decent. The pilgrim climb in Murrisk begins at the base of the mountain at a small laneway on the east side of the carpark of the visitor centre. This path takes you passed numerous stalls such as the legion of Mary as well as vendors selling religious items. At the top of the lane you come face to face with a large statue of St Patrick and get a great view of the mountain looming behind. The weather conditions were pretty good it was a warm day with a slight refreshing breeze. During my climb summit of the mountain was covered with low-lying cloud, that cleared intermittently to reveal the top. I could see people on the summit who from a distance looked like tiny colourful ants. 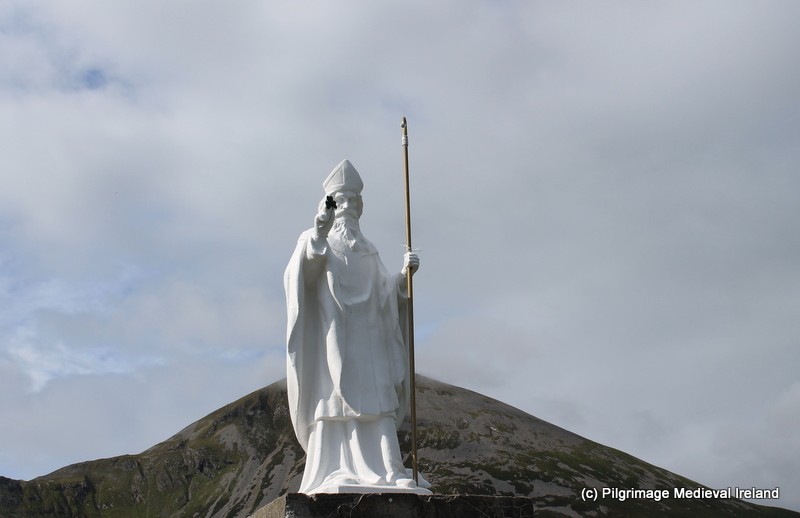 Statue of St Patrick at the base of Croagh Patrick. On the way up the path was very busy with a constant stream of people coming up and down the mountain passing each other by. The pilgrims were made up of all age groups from as young as 7/8 to people in their 80’s. Some people walk alone while others walk in small groups of friends or family. Pilgrims climbing the lower sections of the Cásan Phádraig. 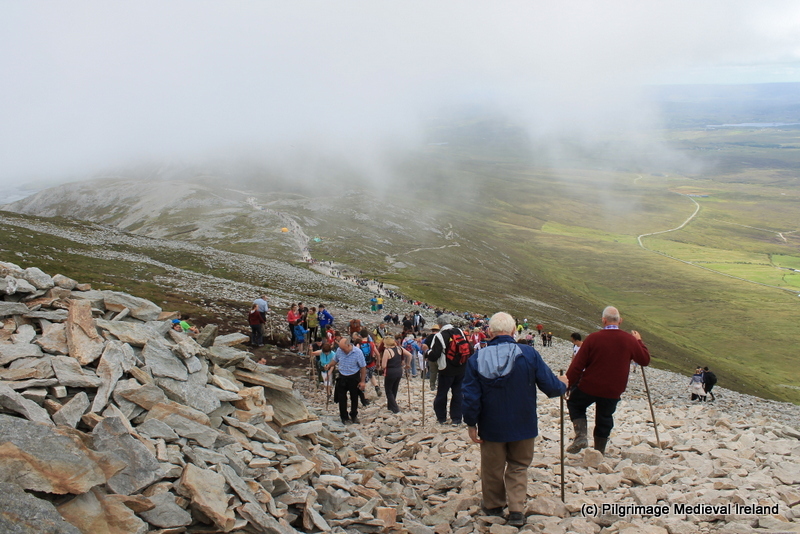 People climb and participate in Reek Sunday for many reasons some for religious and spiritual reasons, others to carry on family traditions and other to experience this unique occasion and to enjoy the amazing scenery. As I walked along I saw a wide range of human emotions; a father and his small child quarrelling about the climb, a woman sitting down and spontaneously crying, children racing along like mountain goats and a woman helping bandage the hand of a stranger who had fallen and cut his fingers. There was a great sense of comradery among pilgrims. I noticed people would often stop and help people who slipped or ask others who stopped for their breath, if they were ok. In the final stages of climbing the cone those coming down the mountain would offer words of encouragement “your nearly there now” “Nearly at the top now”. 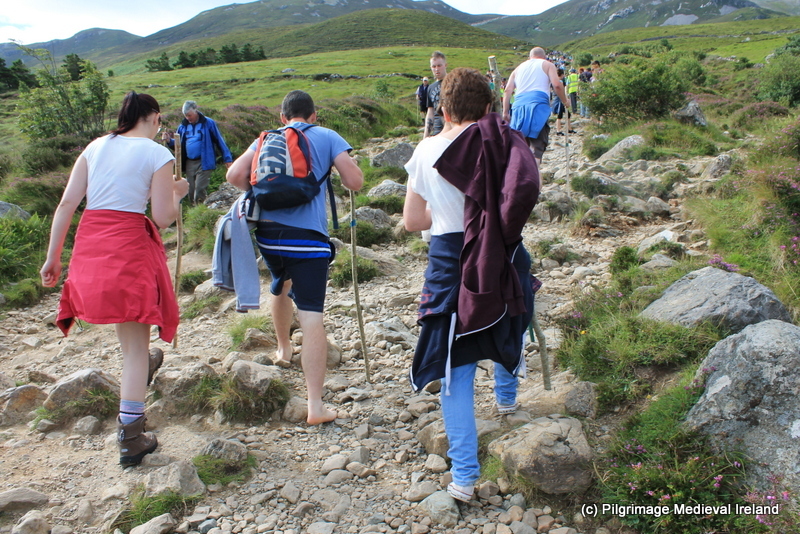 I also noted a handful of people climbing the mountain in their bare feet as part of their penitential pilgrimage. 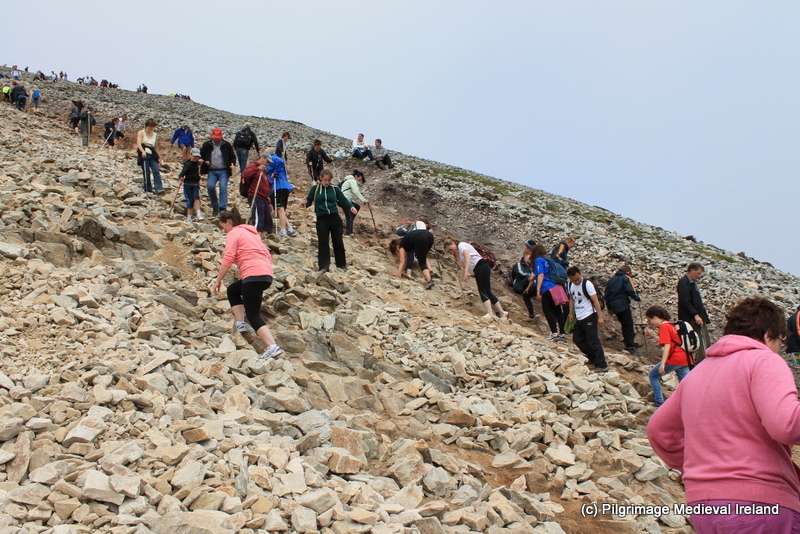 Climbing the Croagh Patrick on such a busy day means that you must pay extra attention to where you walk. One often needs to manoeuvre and avoid walking in the path of those coming down the mountain as well as those walking ahead at a slower pace or those who stop suddenly in front of you. You also need to be aware of where to put your feet and to try and choose the best path ahead. Depending on your level of fitness and weather conditions it can take anywhere between 1.5 to 2/3 to reach the summit. It took me ages as I was constantly stopping to take photos. Cásan Phádraig as it levels out before reaching the cone. 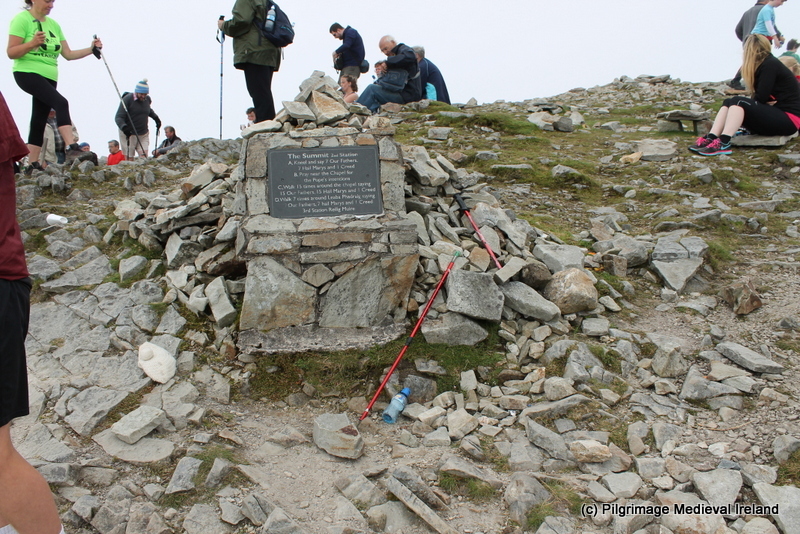 At the base of the cone of the mountain pilgrims encounter the pilgrim station known as Leacht Mionnáin/Benan. This is a large cairn of stones probably of 19th century date. Pilgrims walking in prayer around Leacht Benan a the base of the cone. Pilgrims preforming the rounds (traditional prayer focused on a number of holy foci ) walk in a clockwise direction around the cairn reciting the following prayers; 7 Our Fathers, 7 Hail Mary’s and the Creed. Having finished they embark on the final climb to the summit. The steepness of this section of the route and the movable terrain underfoot make this the most difficult section of the climb. Pilgrims starting to climb the cone of the mountain the final stages of the ascent. As I climbed upward the summit was hidden from by the clouds. The final stage of the climb is very steep and lots of concentration is needed to keep your balance but almost without realising it the ground suddenly becomes flat and you realise you have made it in one piece to the summit. The first thing I did was to sit down and catch my breath. I was sitting on the left hand side of the church lots of pilgrims were sitting down in this area too. It wasn’t long before I noticed the cold air and I was very glad of the fleece top I had packed at the bottom of my rucksack. The summit is a large flat area enclosed by a dry stone wall in poor condition on the top are toilets, a small church and a number of pilgrim stations. The pilgrimage rituals on the summit include visiting the remaining stations or foci of devotion, as well as attending mass and confession. The first station is an unnamed cairn of stones. The pilgrim kneels at the cairn and recites 7 Hail Marys, 7 Our Fathers, and 1 creed. Next the pilgrim prays near the modern chapel for the Pope’s intentions and walks 15 times round the oratory reciting 15 Our Fathers, 15 Hail Marys and 1 Creed. Finally, the pilgrim proceeds to the station known as Leabha Phádraig/Patrick’s bed. This is a small hollow defined by a metal railing. The pilgrim walks clockwise around reciting 7 Our Fathers, 7 Hail Marys and 1 Creed. The small chapel on the summit provided the sacrament of confessions begin on the summit at 7:30am and continuing until 2:00pm. 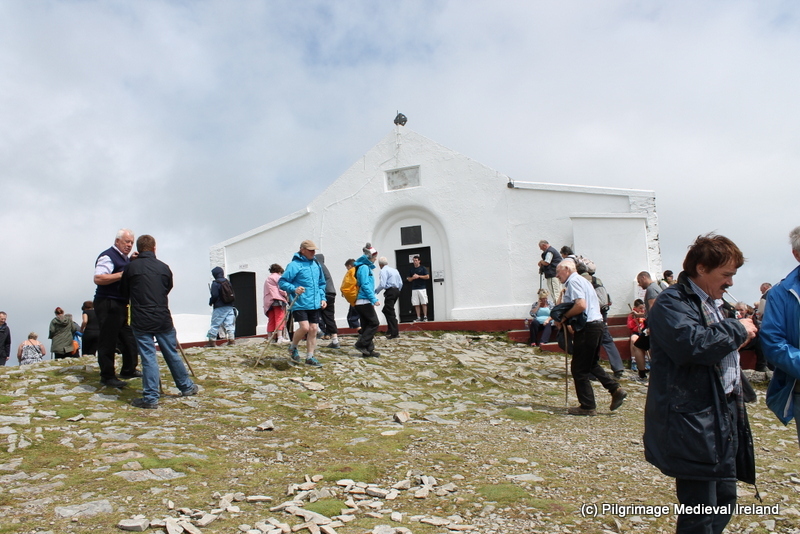 The first Mass on the summit began at 8:00am and every half hour thereafter until the last Mass which at 2:00pm. 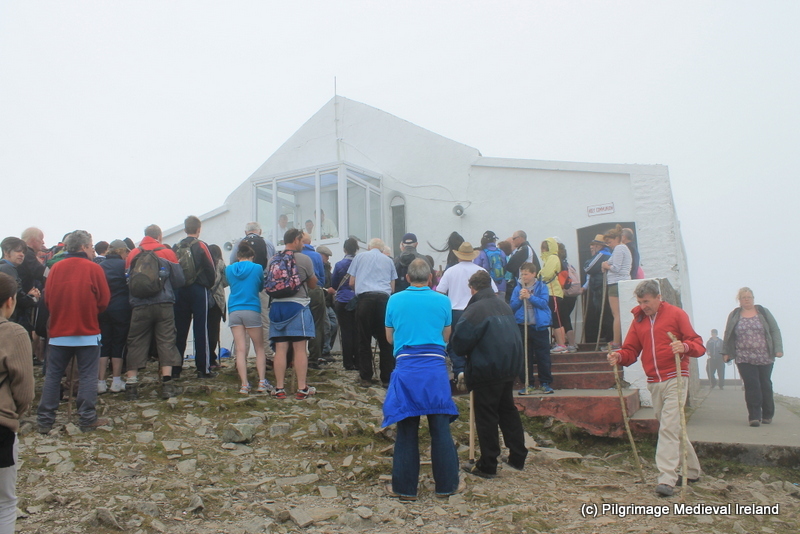 Pilgrims attending mass on the summit. Traditionally the final pilgrim station of the pilgrimage was a visit to large possible Bronze age enclosure called Roiling Mhuire (Virgin’s Cemetery) on the western side of the mountain. Three cairns of stones are found within the enclosure and the pilgrim walked 7 times round each cairn, saying 7 Our Fathers, 7 Hail Mary’s and 1 Creed and finally go round the whole enclosure seven times praying. The majority of modern pilgrims skip this final stage and finish their pilgrimage on the summit. While the pilgrims pray and perform their rounds other pilgrims take the opportunity to relax after their arduous climb many take the opportunity to sit and eat the food they have brought with them or purchased at the food stall that sells tea and sandwiches. 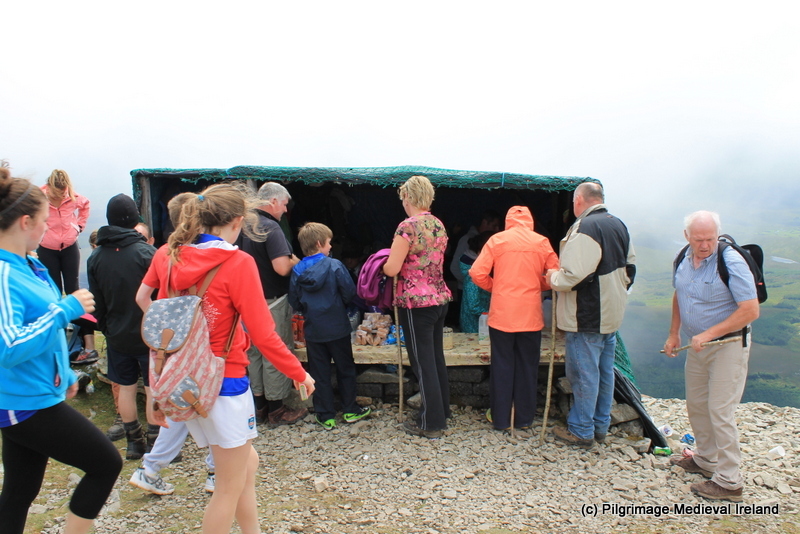 Stall selling food and hot drinks on the summit. The summit was covered in cloud but intermittently the cloud would clear to reveal the stunning scenery and let the sun warm the weary pilgrims. 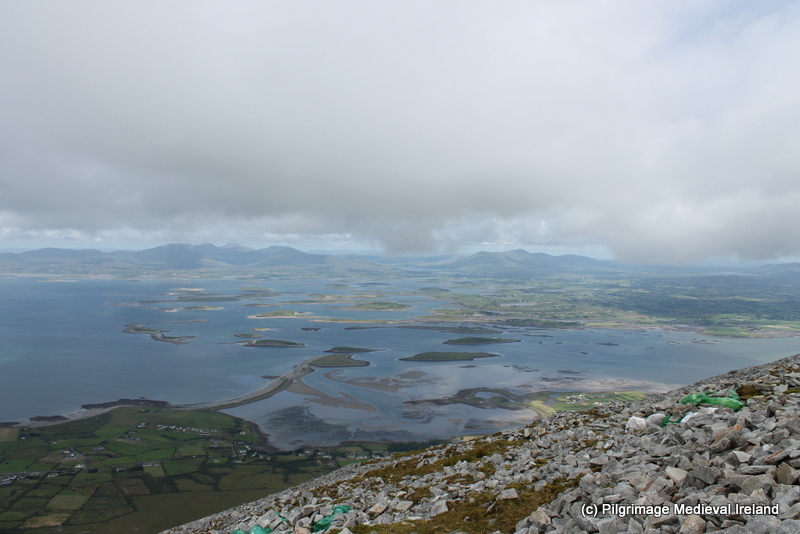 Views of Clew Bay from the summit. 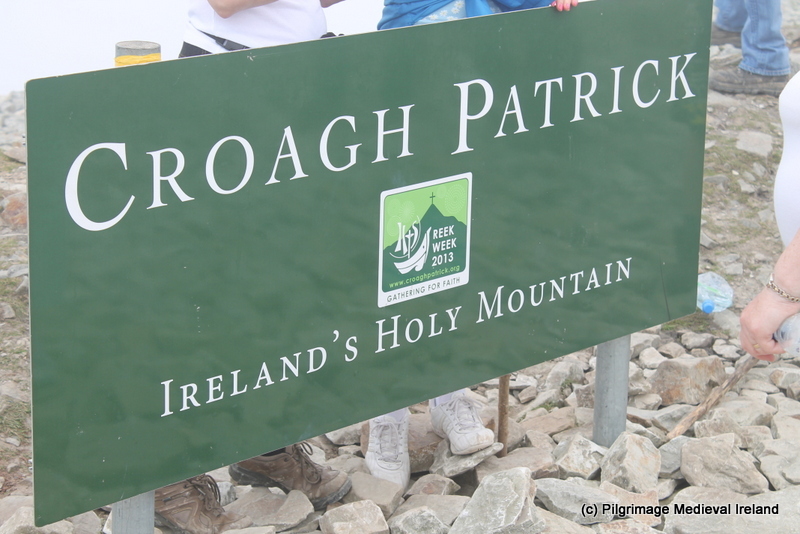 I also notice people taking selfies on their mobile photos in front of the church or Leabha Phádraig while others posed beside a signs placed here in 2013 which says Croagh Patrick Ireland’s Holy Mountain. I am not sure sure why you need a sign to tell you your are on the summit but those who were photographed beside it seem to like it. Sign on top of Croagh Patrick. The final part of the pilgrimage is the decent. Climbing back down is as difficult if not more so then the ascent. This is also when most accidents take place. It was here that I found my trusty stick most useful. Taking part in this pilgrimage was a wonderful experience and I hope I will be lucky enough to take part again in the future. Pilgrims who climb here should also be aware that the constant foot fall of pilgrims and tourists whose numbers can be up to 100, 000 during the year is causing sever erosion of the mountain. To find out more about this check out Mountaineering Ireland website. Having returned safely down the mountain I ended my pilgrimage here by visiting the nearby sites of Glaspatrick and Kilgeever- posts to follow. Further reading on this years pilgrimage. 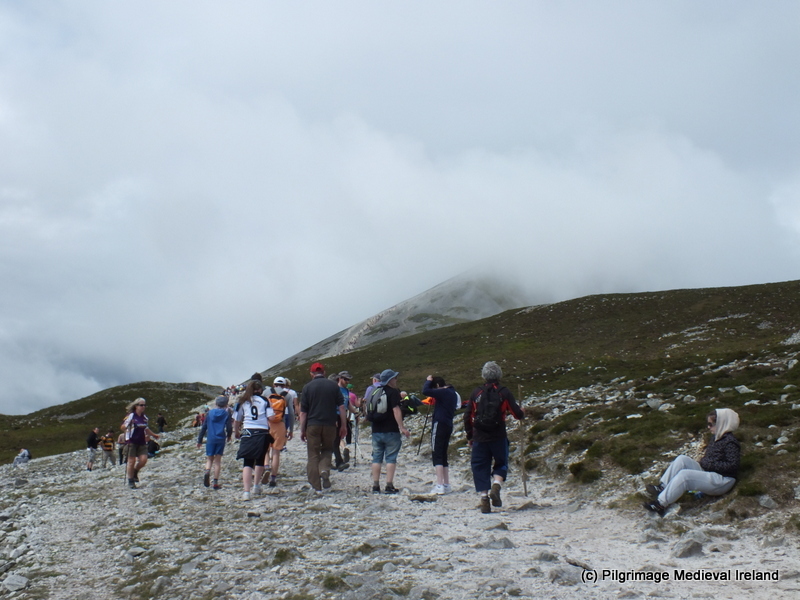 This entry was posted in Modern Pilgrimage, Uncategorized and tagged Climbing Craogh Patrick, Pilgrimage Croagh Patrick, Reek Sunday. 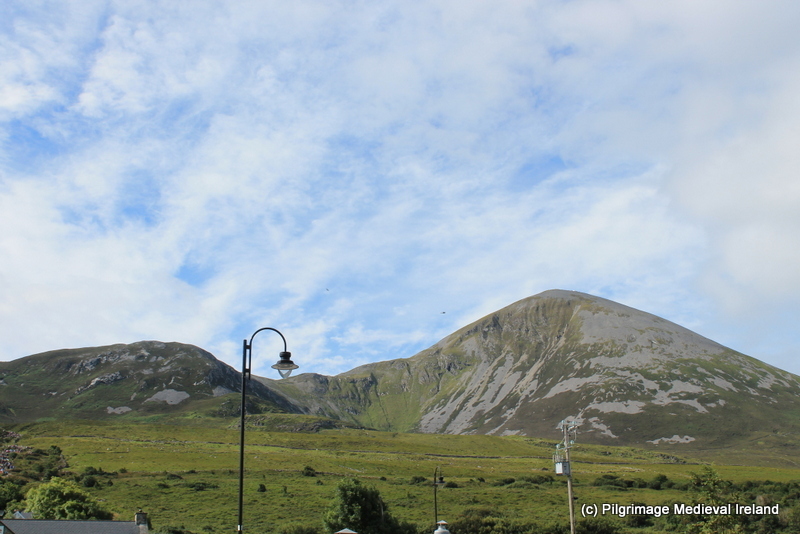 My husband and I climbed Croagh Patrick avfew years back on one of our trips to Ireland. One of my most treasured memories. We had the entire mountain to ourselves. Not another soul encountered until our return and we were leaving the base. We couldn’t imagine it with thousands of others. It is a very different experience when busy like that but its actually really nice. It really is a wonderful place. This is a climb that I would really like to do, and I enjoyed reading your account. Great account of the day! Have never done this, but it’s a goal!